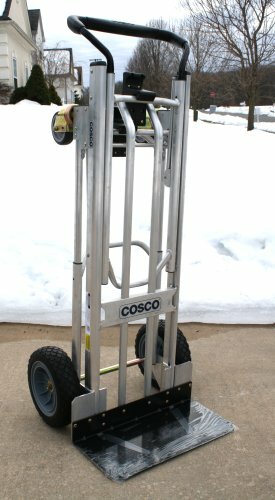 The Cosco 3 Position Convertible Aluminum Hand Truck is the most versatile hand truck in the Hand Trucks R Us line. The 45 degree position allows your cargo to be transported at an angle alleviating the stress on your back and arms. The Cosco 3 Position is equipped with a huge nose to help secure bulky cargo. This hand truck boasts a 800 lb load capacity in the vertical and the 45 degree 4-wheel position and a 1000 lbs load capacity in the 4-wheel horizontal position. Saw this hand truck at a lighting store and was impressed. Took a while to get the unit but worth the wait. It is a well made unit that is easy to use. The wheels absorb shock but are stiff enough to roll easily. Along with some custom built ramps, first use was moving 25 cases of wine out of basement for transport. 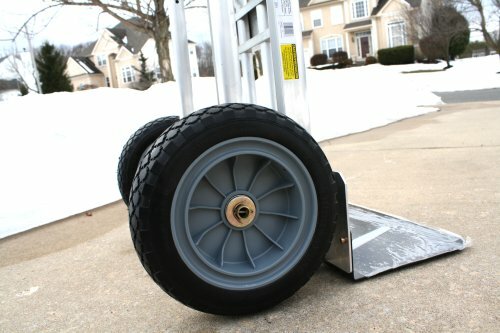 As a homeowner the ability of this hand truck to morph into other forms will make it a great addition to our material handling tools. The hand truck arrived and service was amazing. Thanks so much. I didn't think it was possible to love a handtruck,but after suffering for decades with a cheap one I decided to get a good one. Wow, the Cosco is awesome. It is stable, it can be configured different ways, I wish I had done this years ago. Excellent product and an excellent company. Supremely flexible. Was using one at work onto which we had an aluminum plate to stop small items falling through when leaned back or laid flat. Even the wife loves it. 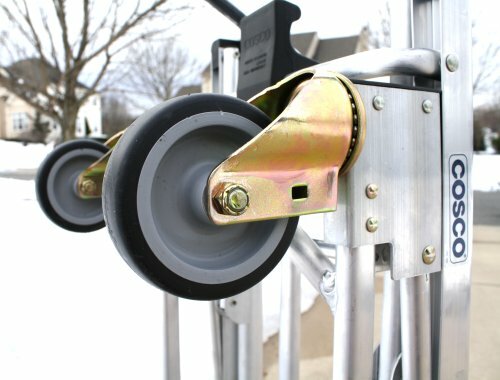 I have been vending for several years and have gone through many hand trucks. This has been the best one by far as durability. I have had 20 cases of soda on it and it moved without a problem. Being light weight helps with lifting it in and out of the truck. 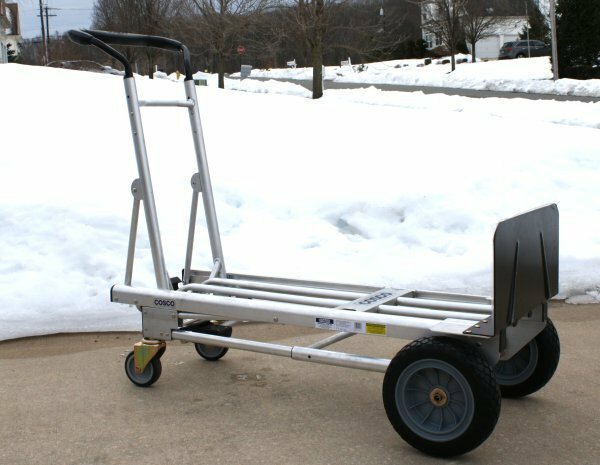 This hand truck is versatile, rugged, and easy to switch between the 3 positions. We use it for everything moving furniture, files, boxes... quality made hand truck at a reasonable price. Buy this. What A Great Hand Truck. I think I will ned to buy more. We purchased the dolly for a specific job but, have found many used for it. It allows us to move large and heavy objects w/o balancing the load. We move tall heavy objects and were struggling getting under doorways. Now we rock it back on the dolly and away we go!. The extended wheel base could be longer. Some tall columns get tippy. This works best with objects that have a center of gravity below the handles. I love that is light but can handle heavy items. It is convient in all of its positions and I use the cart like way alot. Works great. Well built and I am very happy with the hand truck. The new hand trucks have made working here a whole lot easier and the guys even like it as they do not have to use their backs for heavy lifting. I hesitated to buy this hand truck because the description is a little vague, but I am glad I finally did. I really like the way it converts to the three different positions. It slides and latches fast and easy and no pins or handle removal. The design is really amazing. All three positions are very useful and the extra parts don''t get in the way when you just want to use it as a standard hand cart. The extra big foot is really nice to have also. It slides easily under things and helps hold the load steady. A case of bottles is fully supported. It also gives a little more leverage when tilting the hand cart. 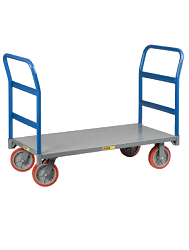 The ten inch pneumatic wheels help it climb stairs easily and the four inch swivel wheels make it a very maneuverable cart. The whole package is light weight yet very strong. I think this hand truck will last me a long time and see a lot of use that will save my back and make my life a little easier. HTRUS delivered it quickly and in perfect condition. This is an item I can highly recommend. I can''t lift much anymore and am moving. I bought this to move boxes from inside the house to the garage. I have to go down a lot of steps and up a lot of steps and I could load five boxes on this cart and handle them all with no problem. I can not even carry one heavy box by myself. It is fantastic.